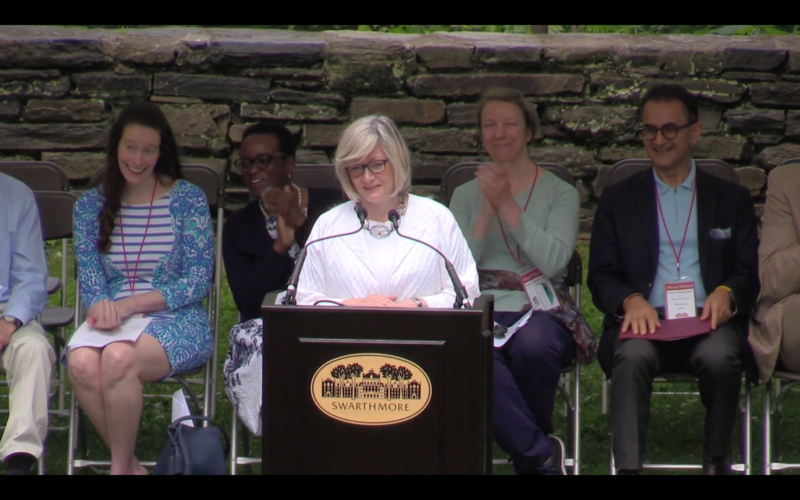 Editor’s note: This op-ed is adapted from the Collection address delivered by Barbara Cochran ‘67 during this year’s Alumni Weekend and her 50th Reunion. During the address, Cochran reflected on the precarious but essential role of journalism in American democracy, as well as her alma mater’s place in her illustrious career. The full speech can be accessed here. The Daily Gazette is committed to honest reporting and tireless truth-seeking, but we cannot fulfill our mission without the trust and support of our many readers and talented writers. My love affair with journalism began at Swarthmore in the newsroom of The Phoenix. Journalism might seem like an odd career choice for a graduate of a college that doesn’t even offer a degree in journalism. 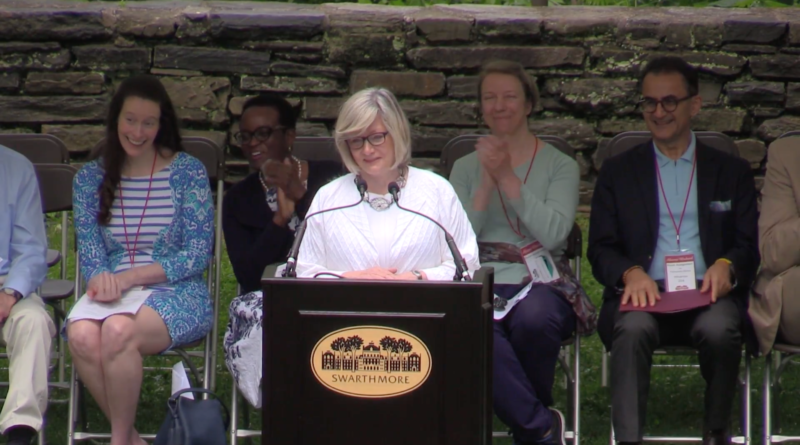 But in fact, Swarthmore has turned out lots of distinguished journalists, including my classmates Kenneth Turan, the chief film critic of the Los Angeles Times, and Jack White of Time magazine. Other prominent journalists from Swarthmore have worked for The Nation, 60 minutes, Newsweek, and Glamour magazine. Journalism skills are mostly self-taught at Swarthmore. We learned on the job at The Phoenix, and later generations did the same at The Daily Gazette, War News Radio and various magazines. Without faculty supervision, we were free to make mistakes, get facts wrong, write incomprehensible sentences and wrongheadedly opine on any subject. Exactly what a free press is all about. Even if we didn’t study the inverted pyramid style of writing a news story, we certainly learned the values that underlie good journalism. Values such as curiosity, willingness to hear alternative views, compassion for the underdog. There’s a saying that the role of journalism is to afflict the comfortable and comfort the afflicted. That sounds a lot like the lessons Swarthmore teaches. Put another way, a journalist’s job is to seek out the truth and tell it in a credible, trustworthy fashion so that the public can make the best decisions for self-governance. Truth, trust and the common good. Or to state in language we’ve grown sadly accustomed to hearing – how do we defend facts in a fake news world? Donald Trump has appropriated the term “fake news” to describe any story he disagrees with. During the campaign, he denounced what he called the dishonest, lazy, failing media and incited his crowds to shout at the reporters covering him. His statements carry more than a whiff of authoritarianism. During the campaign, he talked about “opening up” the libel laws that give journalists wide latitude to write about public officials and public figures. We learned last spring that he asked then-FBI Director Comey if he could bring espionage charges against reporters who write about so-called “leaks,” something that has never been done before. Trump’s derogatory words are having a trickle-down effect. Reporters have been roughed up when they try to question public officials. In June, the Republican candidate for Montana’s seat in the House choked and pushed a reporter to the ground, breaking his glasses. Journalists should not be treated like this in the United States of America. These words and incidents are occurring against a backdrop of declining trust in media, as polls in recent years show. More than half of Americans now believe journalists produce false stories. Among Trump supporters, that climbs to 78 percent. That partisan divide is reflected in Americans’ choices of media outlets. Right now, we’re seeing a glorious competition between the Washington Post and New York Times – an old-fashioned newspaper war in which each one tops the other with new scoops, almost on a daily basis. But those stories are not reaching a large part of the public, who choose news outlets that ignore or downplay stories that reflect critically on the President and his administration. If citizens are operating with different sets of facts from different news sources, and selecting news sources that are most congenial to their political ideology, is it any wonder we’re having such trouble as a country reaching agreement on issues and policies? That’s exactly what journalists need to do now: show by truthful, factual reporting that they can be trusted and that they are seeking the truth on behalf of the public. That’s an important principle that Swarthmore students and student journalists should never forget. Freedom of the press is enshrined in the First Amendment so the citizens of our country have an independent watchdog, beholden to none, that is seeking truth on their behalf. The students who work for Swarthmore’s publications need to observe journalism principles of accuracy and fairness. They also need to be independent and fearless in their pursuit of truth. And all Swarthmore students should remember that our free press may make mistakes, but it is there to keep a watchful eye on the powerful. The free press deserves your support, especially in these perilous times. Barbara Cochran ‘67 is the Curtis B. Hurley Chair in Public Affairs Journalism at the Missouri School of Journalism and director of the school’s Washington program. She has held executive positions in newspapers, radio, television and the non-profit sector. She was managing editor of the Washington Star, vice president for news at NPR, where she directed the creation of NPR’s Morning Edition, was executive producer of NBC’s Meet the Press and then vice president and Washington bureau chief of CBS News–the first woman to head a network bureau in Washington. Cochran served for 12 years as president of the Radio Television Digital News Association. Featured Image courtesy of Swarthmore College. And now for a bit of whataboutism. She said, “…[Trump] asked then-FBI Director Comey if he could bring espionage charges against reporters who write about so-called “leaks,” something that has never been done before. She could have mentioned how the Obama administration named James Rosen of Fox News as a co-conspirator in an Espionage Act case and issued a search warrant for his emails. So, Trump is not breaking new ground here.